Tá roinnt cainte faoi láthair faoin chomóradh a bheidh ar siúl an tseachtain seo chughainn ar an gcéad chruinniú den Chéad Dáil ar Eanáir 21, 1919. Tá dhá ocáíd ann – ceann amháin ar an gCéadaoin, 21 Eanáir, nuair a bheidh Sinn Féin i mbun a gcomóradh, agus ceann eile ar an Mháirt, nuair is é Coimisiún an Oireachtais a bheidh ag tabhairt aitheantas don ocáid. Nócha bliain ó shin, i Seomra an Rotunda i dTeach an Ard Mhéara, a thionól na teachtaí a toghadh thiar, thoir, thuaidh agus theas san olltoghchán cúpla seachtain roimhe. Fuair Sinn Féin sainordú ollmhór san olltoghchán sin chun pairlimint neamhspleach a bhunú. Agus sin a rinne siad. Tá Sinn Féin na linne seo ag déanamh comóradh ar an gcéad chruinniú stairiúil sin sa seomra céanna Dé Chéadaoin seo chugainn. Maith iad! Is cosúil gur eirigh leo an seomra a chur in áirithe roimh ar thit an phingin le Coimisiún an Oireachtais gur ocáid stairiúil é seo, an chéad chruinniú den chéad tionól tofa go daonláthach de reir vóta iomlán an toghlaigh ar oileán na hÉireann. Ocáid stairiúil ar fiú é a chomóradh an chéad chruinniú de Dáíl Éireann an oiread is gur ocáid stairiúil ar fiú é a chomóradh Eirí Amach 1916. Reachtáladh an chéad chruinniú de Dáíl Éireann go h-iomlán i nGaeilge. Cad é an seans go mbeidh níos mó ná ‘an cúpla focal’ ag ocáidí Shinn Féin nó an chruinniú atá á bheartú ag Coimisiún an Oireachtais i nDáil Éireann féin an tseachtain seo chugainn. Aontaím leis an méid a deir Gerry Adams ar a bhlag gur cheart go mbeadh cead cainte ag an gcruinniú Dála seo ag Teachtaí Tofa ó thuaidh den teorainn, an oiread is go raibh cead cainte ag na teachtaí céanna ag an gcruinniú stairiúil. On January 20 the southern state is commemorating the 90th Anniversary of the First Dáil at the Mansion House in Dublin. Those of you who study these matters will know that the First Dáil met there on January 21. Sinn Féin booked the Mansion House for that date. Not that that should have been a problem. A source close to Sinn Féin tells me the party was prepared to make the venue available to the Oireachtas if the state commemoration was made a national event and if there were co-equal speaking rights for all involved. Ah no, came the reply. So there you are……. At least it was accepted that MPs, MLAs and MEPs from the north should be invited. And that’s a good thing. Glacaim leis go mbeidh Uachtarán Shinn Féin, Gerry Adams, féin i láthair ar an gCéadaoin nó deirtear i scéal nuachta ar fhoilsíodh inniu go bhfuil sé ag taisteal go Washington le h-aghaidh insealbhú Barack Obama. Is cinnte go mbeidh sin ina ocáid tabhachtach domhanda – ag an am chéanna, ba cheart don t-é atá i bhfeidhil ar an bpairtí a mhaíonn gurb iad san comharbaí cearta 1919 agus 1916 a bheith ag an ocáíd ar an 21ú Eanáir. Creidim go bhfuil gá le pleán aontaithe agus cinnte le go mbeadh Éire Aontaithe ann sa todhchaí. 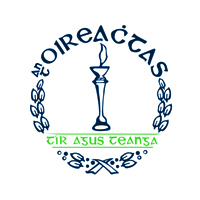 Ní doigh liom go gcreidim go dtarlóidh sé roimh 2016 – ach b’fheidir gur cheart go mbeimís ag smaoineamh go mbeadh parlaimint uile Éireann ann i 2019. B’fhiúntach an chomóradh a bheadh ansin. Creidim gur ghá tosnú ag obair anois ar aondachtaithe a thabhairt ar bhórd agus go mbeadh an Éire Aontaithe a bhainfí amach ina thír go mbeimís aontaithe ina thaobh. Cé go bhfuil meas thar cuimse agam ar laochra 1916 agus, freisin, ar laochra 1981, tá sé in am don tír seo, agus táim ag caint ar thír 32 contae, an oiread chomóradh a dhéanamh ar ocáidí daonláthacha stairiúla an oiread is go ndeintear comóradh ar ocáidí stairiúla ag a doirteadh fuil. Is cuimhin liom bheith i láthair ag an ocáid i 1994 nuair a deineadh cruinniú an Chéad Dáil 75 bliain roimhe a chomóradh. Bhí Cór Chúil Aodha ag cánadh ar an ardán ag Teach an Ard Mhéara. Ocáid stairiúil a bhí ann agus i ndiaidh na h-amhráin bhí togha gach bí agus rogha gach dí le fáil. Chas mé le teachtaí dála agus iad caoch ólta an oíche sin agus mhothaigh mé náire de short éigean de bharr gur iompaíodh ocáid cheiliúrtha agus chomórtha ina ocáid ocáid drabhlais. Ní gá dul thar fóir ach tá gá cinnte le ceiliúradh solúnta. B’fheidir go gcuirfeadh a leitheid sin de cheiliúradh i gcuimhne dár gceannairí pholatúla go bhfuil siad ag suí i suiocháin ar ceannaíodh go daor ag íbirtí ár sinsir. Foilsiú: 15/01/2009 . igaeilge a d’fhoilsigh. Ranganna: An Ghaeilge, Cúrsaí Reatha, Nuacht. Clibeanna: An tOireachtas, Éire Aontaithe, Dáil Éireann, Eirí Amach 1916, Gerry Adams, Sinn Féin. Tá muinéal nach beag ag na shinners. Dhíol siad an phoblacht. agus iad ag reachtáil thart ag cuartú airde. Scois orthu.